This article describes why we created Leanban and provides more details about Leanban. We have learned a lot since the Agile Manifesto was published in 2001. 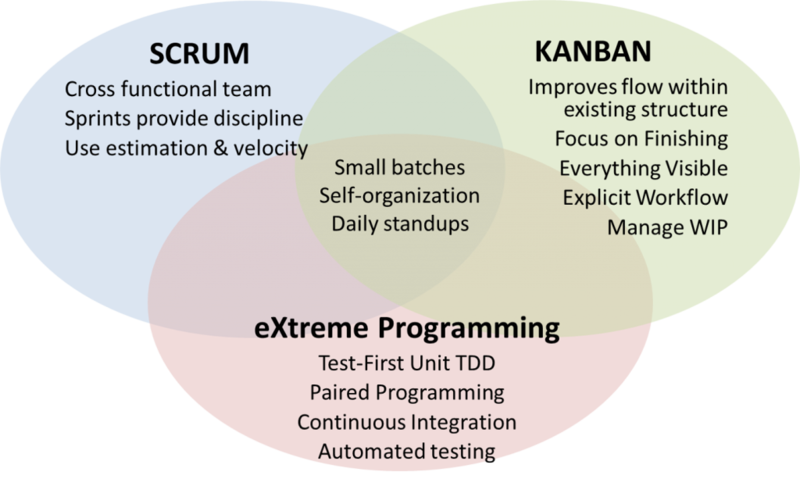 Scrum, eXtreme Programming, Kanban, and others have been used with great success and they provide valuable lessons to teams using different methods. Our understanding of the application of Lean Thinking to software has grown considerably – to the point where we at Net Objectives (and others) now see Lean as the umbrella that Agile fits under rather than a method that fits under the Agile umbrella. Let’s look at the lessons from all of these areas to see how they influenced Leanban. We can take the best of what each has to offer so that we can apply them, or hybrids of them, in ways that fit each team’s and each organization’s context. Create stable teams to help teams improve faster, establish a predictable velocity, and build trust. Build cross functional teams to improve collaboration and eliminate waste. Use short Iterations to get faster feedback to improve learning, enable a clear definition of done, and allow for short term planning. Develop on a cadence to foster discipline and enhance continuous improvement. Focus on DONE to create clarity, limit WIP, and enhance coordination. By incorporating the lessons above into a whole called Leanban we gain a consistent approach to delivering business value. Figure 1 shows where the most common Agile methods are similar and different. Figure 2 shows how each method can be expanded to incorporate ideas from the other methods (note that incorporating ideas into Scrum doesn’t mean you need to call it Lean-Scrum; you can still call it Scrum). 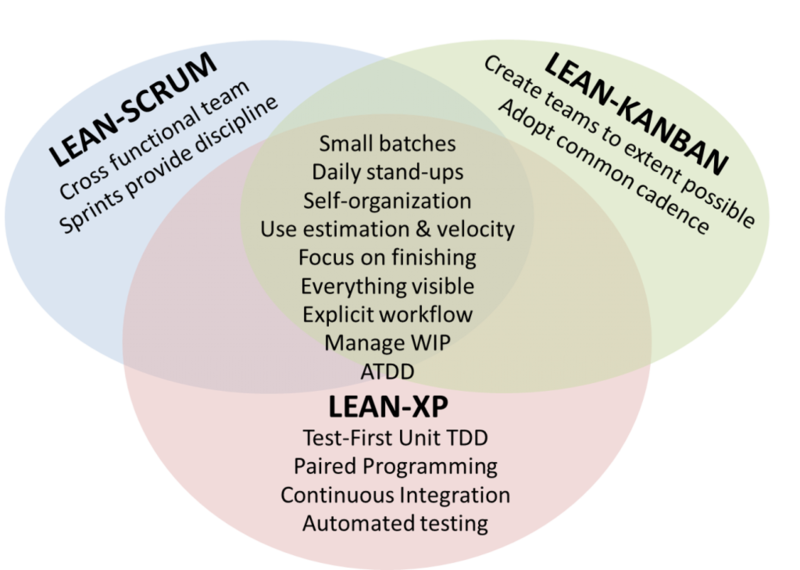 Leanban is shown in the middle as the result of taking the best from each method. Here are some of the important advantages of Leanban. Leanban suggests core practices. Teams get started quickly by following a core set of practices and then Lean Thinking to adjust practices and add new ones based on their needs. Leanban is tailored to each team’s situation. Each team’s situation is unique. Leanban considers the team’s current situation, including whether they are cross-functional, require iterations, and how disciplined they are. Leanban provides a consistent approach across the organization. This enables individuals to move around easily, facilitates learning across teams, and improves management understanding. Leanban takes a systems-approach. Teams deliver business value by working in concert; they must not simply focus on their own work. Leanban provides the mindset for coordination across teams. Leanban provides teams a way to evolve to better practices as they learn. Leanban provides guidance to teams to evolve as practices become inappropriate. It promotes positive change based on achieving the desired outcomes of a practice. Leanban is based on proven principles. Building on good practices improves professionalism and avoids dogma. Leanban facilitates change. Leanban supports change at a sustainable pace guided by Lean practices. It is important to determine what degree of change is appropriate without forcing change or avoiding change. Let’s now look at the four parts of Leanban in depth. Our work is part of a complex system. This implies we must take an holistic view and that our improvement should be guided by increasing our understanding of the system we are in and improving our methods based on that understanding. People are our greatest asset. Management leads the organization in continuously improving its ability to add value to its customers. We create flow by doing things “Just-in-Time”: Eliminating delays in workflow, feedback and utilization is essential to eliminate waste. We must attend to the quality of our process. Not doing so will result in unstable workflows and waste. We must make all work visible. We must manage our workflow with a pull (Kanban) system. For more on Lean Thinking, see Why Understanding Lean Is Essential in an Agile Transformation. Being rigid on our practices isn’t very Agile, is it? We should incorporate other practices that would help us and abandon those that are hurting us. This is not intended to be a complete list; add any additional practices that add value to your team. Leanban uses Lean principles to guide teams in abandoning practices when they are not a good fit. For each practice, focus on the value that it is intended to provide and then investigate alternatives that can potentially provide that same value. See How to Abandon Practices. We have defined a set of guardrails that teams can use to make sure they stay aligned and on track. These organizational commitments provide guidance to ensure that we are on course and allow us to make decisions local to us while ensuring we are still aligned to the rest of the value stream.